"The fourth volume in Peterson's best-selling "conversations" in spiritual theology"Just as God used words both to create the world and to give us commandments, we too use words for many different purposes. In fact, we use the same language to talk to each other and to talk to God. Can our everyday speech, then, be just as important as the words and prayers we hear from the pulpit? 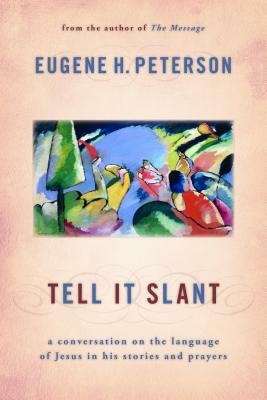 Eugene Peterson unequivocally says "Yes "Peterson's "Tell It Slant" explores how Jesus used language, particularly in his parables and prayers. His was not a direct language of information or instruction but an indirect, oblique language requiring a participating imagination -- "slant" language. "Tell It Slant" beautifully points to Jesus' engaging, relational way of speaking as a model for us today.